The Battle of Okinawa was a major battle between the United States and Japan during World War II and is often considered to be the bloodiest battle in the Pacific Theater of World war II. The battle took place from April 1st to June 22nd in 1945. Similar to the Battle of Iwo Jima, the United States’ plan was to invade the island and use it as a staging ground for a larger assault on the homeland islands of Japan. The Battle of Okinawa was one of the bloodiest in the Pacific Theater of World War II and included the largest amphibious assault of World War II in the Pacific. Since this was one of the last major battles of World War II in the Pacific, it involved the weakened Japanese forces defending the island of Okinawa with extreme desperation. Just as during the earlier Battle of Iwo Jima, the Japanese defenders suffered massive losses. The Japanese defenders generally refused to surrender, due to their code of bushido, and instead carried out a brutal fight to the death. As well, Okinawa saw the use of kamikaze tactics by the Japanese. This involved Japanese pilots crashing their airplanes into American ships on purpose with the hopes of sinking American naval ships. Ultimately, the American military superiority prevailed and the Battle of Okinawa was the last major victory for American forces before the atomic bombing of Japan to end World War II. The Battle of Okinawa was a brutal battle for both sides, and its outcome would come to play a major role in the United States’ decision to use the atomic bombs to end World War II in the Pacific. For example, the Japanese defenders suffered over 75,000 casualties in the Battle of Okinawa while the United States suffered over 65,000 casualties and 14,000 dead. 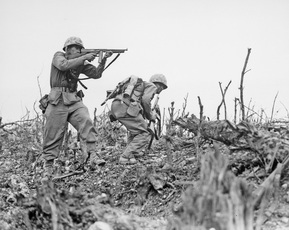 The number of casualties on both sides would convince American President Harry S. Truman that a full-scale American assault of the Japanese home land islands would cause a massive amount of American and Japanese casualties. Some historians now argue that this led to him being in favor of the use of the atomic bombs to end the war.